The worst-ever outbreak of dengue fever in Sri Lanka has killed nearly 300 people, with the number of cases rising rapidly. Sri Lanka’s Ministry of Health reports that the number of dengue infections has climbed above 103,000 since the start of 2017, with 296 deaths. The number of cases this year is already nearly double the number of dengue infections recorded in all of 2016, when 55,150 people were diagnosed with the disease. The Sri Lanka Red Cross Society and the International Federation of Red Cross and Red Crescent Societies are rapidly scaling up emergency assistance to help contain the outbreak in the South Asian island nation. “Dengue is endemic here, but one reason for the dramatic rise in cases is that the virus currently spreading has evolved and people lack the immunity to fight off the new strain,” said Dr. Novil Wijesekara, head of health at the Sri Lanka Red Cross. 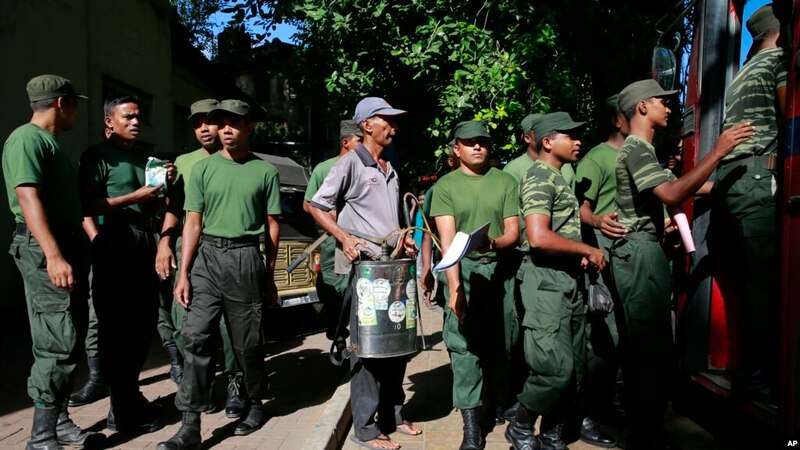 FILE – A Sri Lankan municipal worker, center, along with army soldiers leave for Dengue fever eradication work in Colombo, Sri Lanka, July 4, 2017. Compounding the crisis, recent monsoon rains and floods have left pools of stagnant water and rotting rain-soaked trash — ideal breeding sites for mosquitoes. Ongoing downpours and worsening sanitation conditions raise concerns the disease will continue to spread. Dengue is common in South Asia — especially during the monsoon season which runs from June to September — and, if untreated, it can be lethal. The International Federation of Red Cross said it had released new disaster emergency funds on Monday to help about 307,000 people in three districts where dengue is rampant. “The size of this dengue outbreak is unprecedented in Sri Lanka,” Jagath Abeysinghe, president of Sri Lanka Red Cross, said in a statement. This entry was posted on Monday, July 24th, 2017. You can follow any responses to this entry through the RSS 2.0 feed. You can skip to the end and leave a response.